Washington dropped to 35th place in the nation with a D+ in the American College of Emergency Physicians (ACEP) America’s Emergency Care Environment: A State-by-State Report Card released January 16. In 2009, the state ranked 19th in the nation with a C. While our State ranks in the top 10 in the categories of Public Health and Injury Prevention, and Quality and Patient Safety, Washington received failing grades in three out of five categories. Since 2009, our State did improve its overall ranking in the category of Access to Emergency Care. Washington still received a failing grade in this category, in part because of a severe lack of resources and inpatient capacity for mental health patients. The state also has some of the lowest levels in the nation of staffed inpatient and intensive care unit beds. To improve our grade, Washington must make greater investments in hospital infrastructure and mental health care, according to the Report Card. Read more. Send the WA-ACEP Press Release to your local media outlets. Please contact the WA-ACEP office if you need media information. Use the talking points to draft a Letter to the Editor for your local newspaper. Please coordinate this effort with the WA-ACEP office. Contact your State House and Senate Members. Reference the talking points “Solutions” in your message. The College announced at the annual meeting that it has joined the Choosing Wisely campaign. ACEP released its list of five tests and procedures that may not be cost effective in some situations and should prompt discussion with patients in order to both educate them and gain their agreement regarding avoidance of such tests and procedures, when appropriate. Learn more. View the WA-ACEP Choosing Wisely Powerpoint Presentation for more information. 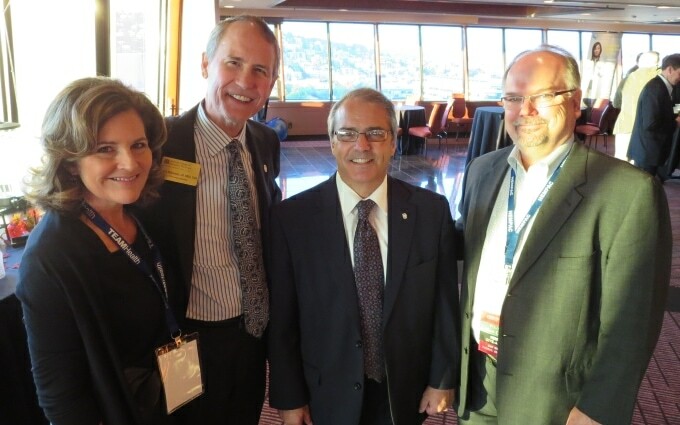 Mrs. Wilkerson, ACEP Executive Director Dean Wilkerson, Washington Lt. Gov Brad Owen and WA-ACEP Past President Steve Marshall at the WA-ACEP Space Needle Reception during ACEP13. Although ACEP13 has ended and the more than 7000 attendees have departed Seattle, the buzz from the meeting will linger and remain palpable over the coming year. Because of your support, attendance, and leadership, ACEP13 is now THE most successful ACEP conference ever! Thank you! Attendance at the kickoff party and our own Space Needle reception marked record-setting numbers as well.The visibility, credibility, and respect garnered will serve this chapter well for many years. Thank you for your continued support of the Chapter, College and Emergency Medicine! 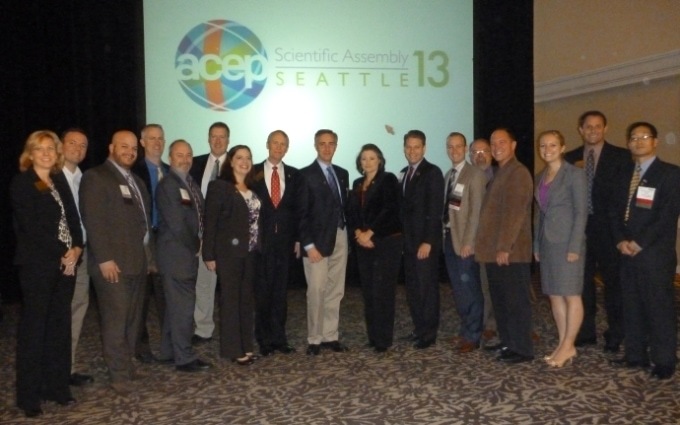 ACEP13 held in Seattle during October set four-day attendance records that exceeded 7000 members! In fact, ACEP13’s Opening Party at Seattle Center and Closing Reception at the Museum of Flight had the highest attendance of any similar type events in the meeting’s history. The WA delegation poses with ACEP Staff, Dean Wilkerson, Sonja Montgomery and Craig Price. Members of the WA ACEP Board of Directors were able to talk in person with national ACEP staff on the Fair Billing Issue, Regionalization of Care, research on the impact of the legalization of marijuana on emergency departments, nationalization of an Opioid Prescription Monitoring System, and upcoming release of the National Report Card on the State of Emergency Medicine. Because of your support and attendance, ACEP13 is now THE most successful ACEP conference ever! Find out why More CME is Better, if it’s better to be Fast or Slow and if you should go to ACEP13 or stay home.